A traffic camera in Des Moines. The Iowa Department of Transportation released its review today of automated speed and red light cameras and it recommends removing at least one camera from each of the six cities. The DOT’s director of traffic and safety, Steve Gent, has been overseeing the process. “Statewide there are 34 camera locations on the primary highway system that the DOT reviewed. Twenty-four of those locations will be allowed to stay and continue as is. Then nine will be required to be removed,” Gent says. He says one camera that had been taken down in Sioux City during construction will not be allowed to be reinstalled. The cameras have been at the center of controversy since they began operating, as they bring in millions of dollars to the cities. The DOT created rules in February of 2014 to govern the cameras that are placed on state highways. Gent says the goal was to ensure the camera were being used as a tool to increase the safety on the roadways. He says they did look at other information regarding the cameras along with the crash data. “Is the city looking at other safety counter measures and just a variety of things that the DOT is looking at — what other safety counter measures has the DOT installed since the cameras went in,” Gent says. The cities were sent notices today. Cedar Rapids was asked to remove cameras in three locations and make modifications to other cameras. Des Moines, Council Bluffs, Muscatine and Davenport were each asked to remove cameras. Sioux City was asked to remove cameras in two locations along with the one that will not be reinstalled. “The cities for the cameras that need to be removed, they have a month to do that, April 17th. And then if they want to appeal, they can certainly appeal that to the Iowa DOT director as spelled out in the Iowa administrative code,” Gent says. Gent says the cameras will be reviewed every year, but things should get easier. “Once we get through this first phase, the cameras that are in place, that are allowed to stay in place, will have a much better chance of staying there in the future,” Gent says. You can find the reports for each city on the DOT’s website at: www.iowadot.gov/ATEReports/atereports.html. Disable speed detection from the camera system at the 1st Ave. and 10th Street intersection for the following reason: the westbound speed camera is within the first 1,000 feet of a lower speed limit. 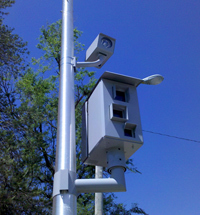 This set of cameras is located 859 feet beyond a speed limit reduction from 60 mph to 55 mph. Remove or disable the northbound I-380 cameras near J Avenue: The location of the camera is well beyond the “S” curve and therefore beyond the area of concern. Move the southbound interstate speed cameras located near J Ave to the next truss south; located near G Ave. This allows this camera location to comply with the 1,000 foot requirement of Iowa Administrative Code and will locate the camera closer to the beginning of the critical “S” curve. Remove or disable the southbound I-380 cameras near 1st Avenue ramp: The location of the camera is beyond most of the “S” curve and therefore beyond most of the area of concern. . Remove the camera on at the 30th Avenue location as crashes essentially stayed the same. No reinstallation of cameras at Gordon Drive and Nebraska Avenue. Remove the speed cameras from I-29: The number of annual crashes varies greatly over the past 10 years with specific trends both upward and downward. It is difficult to determine the effect the speed trailers have had on the number of crashes. The reconstruction project is in the process of building a new and safer freeway system throughout Sioux City. Other safety countermeasures have been implemented. Iowa Administrative Code: Limited use on interstate roadways. Remove the eastbound I-235 cameras near Mile Marker 4.9:Crash rate was low before the cameras were installed. Iowa Administrative Code. Limited use on interstate roadways.